... only to later discover that it was the output created by a new slurry pump that had sent readings soaring to numbers previously not recorded by the site’s instrumentation. “He didn’t believe it at first”, said Paul Davies from Landia. “He wasn’t happy to begin with but didn’t mind admitting later that he thought it had been his flowmeter playing up”. The reason for his welcome surprise was that a new pump from Landia had produced an unprecedented throughput. Some had told the farmer that it wouldn’t work for the very tough AD/feedstock application – and initially he agreed with them – but they were all proved wrong. Davies added: “Prior to the installation, he couldn’t run at maximum output, which was very frustrating, but now all of a sudden, what was previously taking an hour to process has been reduced to just 25 minutes – enough to make any AD operator/farmer happy”. Designed for a very specific application, directly on from the digestate feeder, the farm and its AD operation were almost immediately able to reduce the cost of its energy-rich feedstock. Established over a century ago, the 2,000-acre farm first invested in Landia slurry pump (a submersible 7.5kW) in 2003, which is still in operation. It continuously mixes what has now become a valuable feedstock, rather than a waste that must be dealt with. Investing in its own AD plant four years ago, the farm’s annual electricity bill was around £55,000 – but the 1.5MW of power now produced easily covers that now historic outlay, with a healthy surplus sold on to the National Grid – and excess heat put to good use for drying the farm’s bedding. The feedstock of cow slurry, maize, rye and sugar beet is topped up with fruit and vegetable food waste from local wholesalers – which after being held in a 500m3 buffer tank, is pumped to a heat treatment tank, before it is sent to the primary digester. The resulting digestate is pumped to two storage tanks of 240m3 and 500m3 – before the final liquor is sent to the farm’s slurry lagoon. The high pressure 22kW Landia Chopper Pumps are designed with an external knife system that stops any solids from entering the pump’s casing. Throughout the operation, the Landia pumps at the farm (which all run on variable speed drives to maximise the life of the impellers) continuously reduces particle sizes, which benefits the entire process. In total, there is now one mixer and nine pumps from Landia, including three longshaft designs and four dry-installed pumps. Paul Davies from Landia added: “We’ve worked with the farm for a long time and wanted to help them optimise their new AD process. We were faced with several challenges, but we’ve put our heads together and were determined to achieve the required result. “In the end, we found a way of boosting the pumps with an extra loop in the pipework. 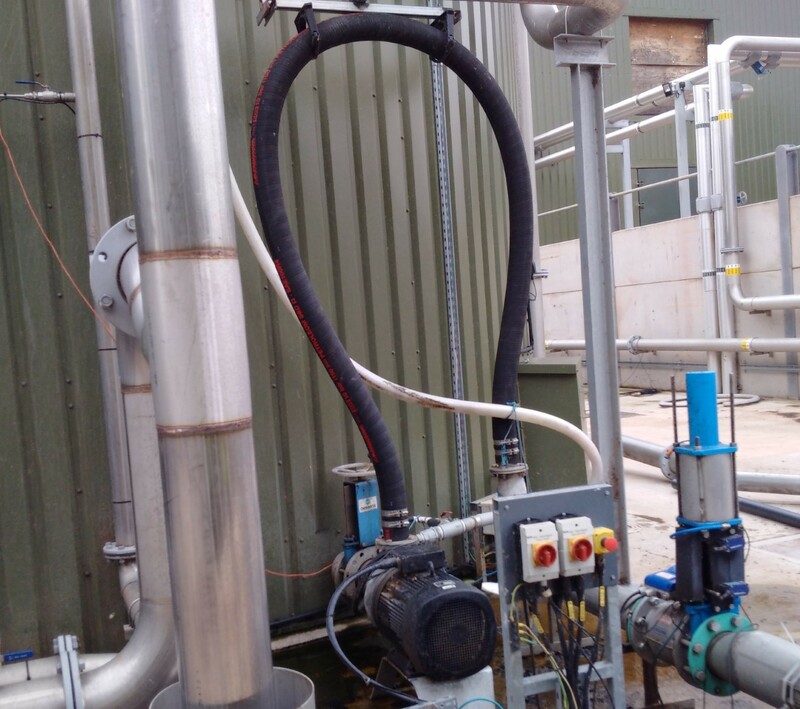 ‘Live digestate’ can cause problems for many pumps and pipework, with so much extra gas being released, but our design and the robustness of the pumps means that nothing has tripped out”.